Chickenpox Outbreak Hits N.C. Private School With Low Vaccination Rates Three dozen students have been infected at Asheville Waldorf School — which has among the very highest rates of parents claiming religious exemption from state vaccine requirements. At least 36 students at a North Carolina school have become infected with chickenpox. The school has many students whose parents claimed a religious exemption from state vaccination requirements. The sudden outbreak of chickenpox at a North Carolina private school isn't exactly surprising. At least 36 students have become infected with the disease at Asheville Waldorf School in the city of Asheville — a school that has among the highest rates of parents who received an exemption from the state's vaccination requirements. For the 2017-2018 school year, nearly 68 percent of the 28 kindergarten students at Asheville Waldorf received valid religious exemptions from vaccinations. Buncombe County, in the Western North Carolina mountains where Asheville is located, had the state's highest percentage of religious exemptions — with 5.7 percent of its 2,542 kindergartners receiving one. Varicella, better known as chickenpox, causes a blisterlike rash as well as itching, fever and fatigue. While it's not usually a serious illness, it can be more dangerous for infants, adults, pregnant women and people with weak immune systems. And it's highly contagious. The chickenpox vaccine was first licensed for use in the U.S. in 1995. The CDC recommends that children get a first dose of the vaccine at 12 to 15 months of age, and a second dose between the ages of 4 and 6. North Carolina requires all children in the state to receive certain immunizations, including two doses of the varicella vaccine. But it does allow a religious exemption, which only requires a parent to "write a statement of their religious objection to immunization." It does not need be notarized or signed by a religious leader. The state says there may be no exception to the required vaccine requirements "for the case of a personal belief or philosophy of a parent or guardian not founded upon a religious belief." But Jennifer Mullendore, medical director at the Buncombe County Health and Human Services Department, said that for many parents who claim the religious exemption, "it's more of a personal belief or a philosophical mistrust" that drives the aversion to getting their children vaccinated, according to the Asheville Citizen Times. The rate of unvaccinated children in Buncombe County is so high that the county created a coalition earlier this year to try to tackle the issue — but even Mullendore isn't sure what will be effective in persuading parents to vaccinate. She noted that the parents choosing not to vaccinate tended to be educated and well-off — and that because vaccines have been so successful, many parents have never encountered an outbreak and don't take the threat seriously. "What happens when we lack community immunity? Measles is what happens," Mullendore told county commissioners last month. That's exactly what happened three years ago, when there was an outbreak of 125 cases of measles tied to people who had visited Disneyland and another California theme park. Europe is currently battling a measles outbreak in Romania, France, Greece and Italy. The European Centre for Disease Prevention and Control says at least 33 people have died from measles this year and that vaccination coverage is now below 95 percent in most countries. 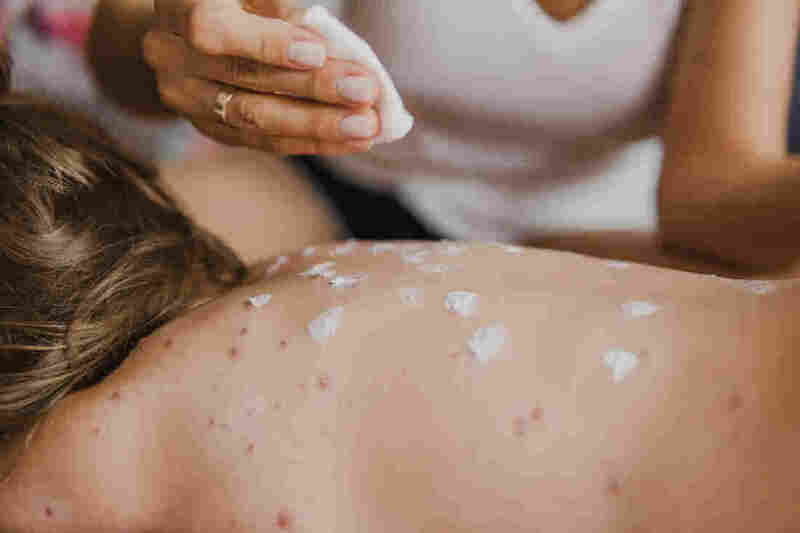 That's worrisome, because to protect against a highly contagious disease such as measles, which can spread from person to person through the air, health experts say a community needs a 93 percent to 95 percent immunity rate. Health officials say that in Rockland County, N.Y., a current outbreak has resulted in dozens of cases of measles, many in the Hasidic and Orthodox Jewish communities. A number of yeshivas in the area have vaccination rates between 44 percent and 80 percent, the Rockland/Westchester Journal News reports. Cases of measles also have been confirmed in New York City and New Jersey. Some of those cases have been tied to people traveling from Israel, which is also experiencing a measles outbreak, with more than 1,500 confirmed cases, the Journal News reports. The Asheville Waldorf School said in a statement to Blue Ridge Public Radio that its "students' overall health is always a priority and concern." "The school follows immunization requirements put in place by the North Carolina State Board of Education," it said. "We also recognize that a parent's decision to immunize their children happens before they enter school. At Asheville Waldorf School we support our families, we love our students, we love our city and we are grateful that our community is strong during challenging times."